Directions to Amherst Golf Club - From the 104 just west of the Sunrise Trail at Truemanville, turn south on the groomed pipeline to Warren and head toward the 2 monster wind turbines. 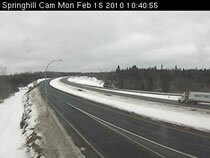 Colchester County the Heart of Nova Scotia is nestled at the head of the world famous Bay of Fundy and is located at the junction of Highway 102 and the Trans-Canada Highway. Welcome to the Cumberland Snowmobile Club’s official website. It is shaping up to be a long snowy winter this year and if you’re visiting this site, chances are you’ll be spending a lot of time enjoying our scenic trail system. We are a volunteer-run club and we make our best effort to maintain and groom over 550 kilometers of snowmobile trails that traverse both Cumberland and Colchester counties. 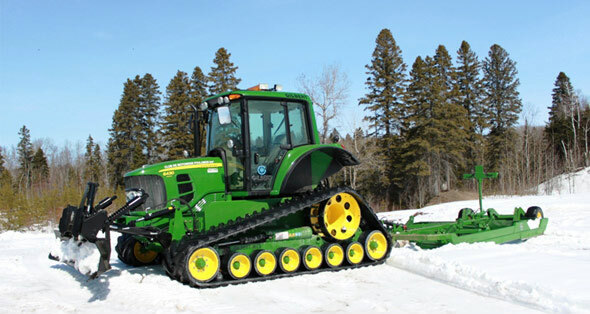 In 2014, we took delivery of a brand new John Deere groomer with a Gilbert RTS track system. 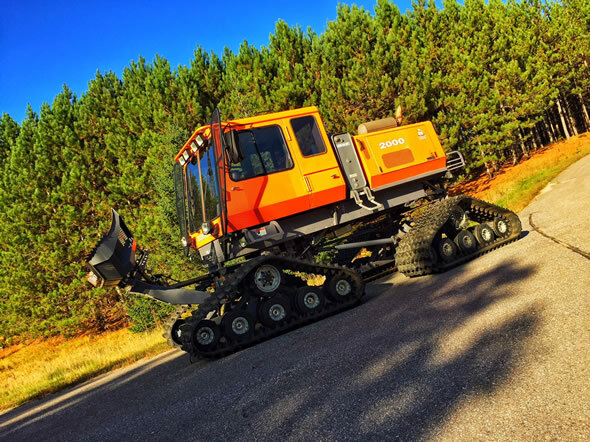 In 2015, we added a second AGCO Gilbert unit to handle our improved trails in the Amherst area. In 2017, we added a third unit for the Springhill area which is a Tucker Terra 2000. Our volunteer groomer operators are anxious to get out on the trails and get them in optimum shape for the best sledding. Our trails have never been in better shape, thanks to a number of grants that were secured. We completed a large portion of the Trans Canada Trail joining to New Brunswick, and upgraded many areas and bridges in the so-called off season. We now have 5 warming shelters and rest areas equipped with outdoor toilets throughout our system. Please stop by our newly renovated clubhouse. Our canteen staff will be cooking great breakfasts, burgers, soups, chili and specials for hungry snowmobilers. The canteen will be open Fridays from 3-9, Saturday 8-6 and Sundays 10-4. This winter we will have fuel available at the clubhouse for emergencies. Members enjoy complimentary Wi-Fi at the clubhouse and a passcode to access the clubhouse in urgent situations after hours. Generally, our membership roster is just over 140 members in good standing. If you enjoy our trail system and like the direction we are headed, consider joining our club. We accept online payments for club memberships and trail permits via PayPal here on the website, you can purchase them at the clubhouse canteen during operating hours or you can contact one of our directors for more information. A regular membership to the club is only $25. We are offering V.I.P. memberships for $100 if you are able to contribute a bit extra towards trail and grooming expenses. Our meetings are held the first Saturday of the month at 7 p.m. and we encourage all to attend and participate. As always, we would like to take this opportunity to thank our tireless volunteers keeping the club running. We are grateful to our Groomer Sponsors and V.I.P. Members – without them, we could not have accomplished financially what we did in this past year. Also, we would be remiss not to mention our volunteer groomer operators. They work long hours during snowmobile season to make the trails smoother for us – often sacrificing their own snowmobiling hours or family time. Happy trails and safe sledding! If you would like to be added to our email list for events and updates, please click here.